The Biosecurity Warrior delivers science-based content and messaging from the NSW DPI educational charter. The Biosecurity Warrior’s mission is to educate the community in an engaging, interactive and relevant way to help spread the message that biosecurity is a shared responsibility and we all have a role to play in protecting our economy, environment and community from pests, diseases, weeds and contaminants. Our aim at NSW DPI is to turn every person in the state into a Biosecurity Warrior by ensuring they know how to identify biosecurity risks and take action to eliminate them. Biosecurity Warrior is a Trademark of NSW DPI. 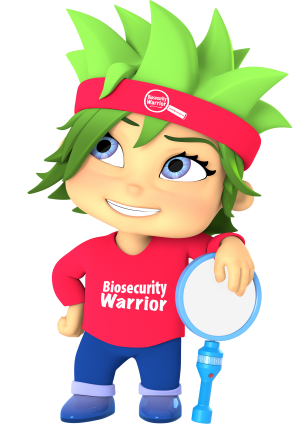 Other organisations can apply for a licence to use Biosecurity Warrior to help spread the word about biosecurity. Biosecurity in NSW focuses on ensuring the supply of healthy safe food, recreational access to our state's natural resources and minimising the risk to native flora and fauna. NSW DPI works with other government agencies, industry and the community to protect against biosecurity threats and the negative impacts of animal and plant pests, diseases and weeds. We all have a role to play in minimising biosecurity threats. Australia is free of many of the pests, weeds and diseases found in other parts of the world. We need your help to keep it that way - here's how you can be a Biosecurity Warrior and help to keep Australia clean, green and healthy. Regularly inspect your home and garden for anything that looks unusual. Keep a lookout for pests or weeds or anything that might be a risk. Take a photo to help DPI officers with identification. If you see something unusual or suspect an illegal activity report it to the Biosecurity Hotline on 1800 680 244 or via our online report form. Remember - biosecurity is a shared responsibility which starts at home. 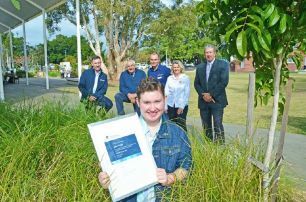 Meet Milo Yeigh, the 19 year old man who spotted a strange ant in Lismore and reported it to NSW DPI. Milo is a self confessed ant enthusiast who discovered the yellow crazy ant infestation in Lismore central business district in May 2018. Milo, was killing time at the Quad when he spotted the invasive ants and decided to ring the Biosecurity Hotline. Following Milo's report, NSW DPI and Local Land Services (LLS) immediately began undertaking surveillance work and developing a control strategy to minimise the spread of these ants. The Hon Thomas MP George, Member for Lismore, NSW Department of Primary Industries (DPI), Local Land Services (LLS), Lismore City Council, Rous County Council, National Parks and Landcare representatives gathered in Lismore on Friday, 22 June 2018 to acknowledge Milo's efforts and the community response. This was a great opportunity to be able to recognise Milo who essentially kicked off this all agency response, simply by being aware to his surroundings and caring enough to report it. The yellow crazy ant is considered one of the top 100 examples of the world’s worst invasive species, with the potential to do serious damage to the local environment and agricultural production. Because of Milo's quick action, he has helped to stop the spread of a serious invasive pest and biosecurity threat to NSW and is protecting our environment from yellow crazy ant. A Western Sydney warehouse manager has played a crucial role in the eradication of a harmful exotic pest and was recognised for his part in protecting NSW’s $1 billion horticulture industry. In 2017, Hager Electro’s John Matakaiongo detected the invasive brown marmorated stink bug (BMSB) in a shipment of imported electrical equipment from Italy. He immediately reported his find, prompting a 12 month eradication and monitoring campaign led by Greater Sydney Local Land Services in partnership with NSW Department of Primary Industries (NSW DPI). In August 2018, NSW was officially declared BMSB free and Mr Matakaiongo was recognised for his contribution. NSW DPI Deputy Director General Biosecurity and Food Safety, Bruce Christie, said the pest could not have been eliminated without the quick thinking and cooperation of Mr Matakaiongo and his team. “Thanks to John’s vigilance we were able to launch an immediate response,” he said. “Reports like John’s are the biggest weapon we have in the fight to protect the NSW environment, economy and community from the threat of pests and disease,” he said. BMSB is a serious exotic insect known to feed on more than 300 hosts including nuts, grains, berries, cotton, citrus, soybean, nursery stock, ornamental and weed plant species. In the United States, BMSB was first observed in 1996 and has since spread to 40 states and Canada. It has resulted in significant economic impacts including losses of up to 100 percent in Maryland peach crops. Over winter they are known to be a serious nuisance and invade homes and indoor spaces in large numbers. Greater Sydney Local Land Services Manager, David Hogan, said Spring is recognised as the danger period for new BMSB detections. “BMSB is known to stow away in cargo coming out of the northern hemisphere between September and April,” he said. More information on brown marmorated stink bug can be found on the NSW DPI website. Chris Rehberg has long been passionate about our native wildlife, conservation and the environment. But he could not have known that one lunch time nature walk would see him play an important role in protecting the NSW environment from one of the world’s worst invasive pests. As a part-time photographer, Chris was in the habit of packing his camera for work. His lunch breaks consisted of a stroll around the local lake where he indulged his passion for wildlife photography. It was on one of these walks that Chris spotted five invasive Red-eared slider turtles basking on an island. The Red-eared slider turtle is native to the US and Mexico and is listed by the International Union for the Conservation of Nature as one of the world’s worst invasive species. They compete with native turtles for food, nesting areas and basking sites and aggressively prey on native frogs and fish. They have no native predators and are known to harbour infection causing salmonella bacteria. Chris had limited knowledge of native turtles but he suspected those he encountered did not belong in his local lake. A web search and a discussion on social media confirmed he had reason to be concerned. He quickly found himself on the phone to the NSW Department of Primary Industries’ (NSW DPI) Biosecurity Hotline. 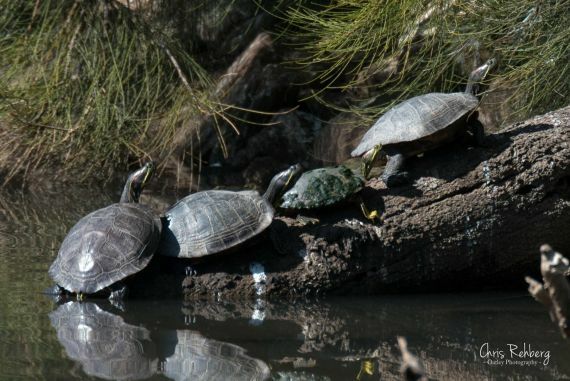 Reports like Chris’ are proving the data for NSW DPI scientists to build a better picture of the distribution of the Red-eared slider turtle species in NSW. The data will also inform the development of management plans that will allow us to better protect our native wildlife and environment from this non-native invasive pest animal. NSW DPI has developed a Biosecurity Warrior Training Manual to assist children in understanding the importance of Biosecurity. This workbook has a range of activities to identify the Biosecurity Baddies and Goodies, plus a number of actions that you can do to help the biosecurity mission. Be a Biosecurity Warrior and defend against weeds and bugs in your own backyard. Costa Georgiadis talks about how to tell the difference between Biosecurity Goodies & Baddies and meets Biosecurity Warriors who have exciting and interesting jobs using science, technology, research – even dogs – to stop diseases that make our people, our crops, our native animals and insects sick. Come on our biosecurity journey and learn about bees, insects, chooks, pets and how we can all be Biosecurity Warriors by looking after our own backyards.